Retirement has previously been perceived as an oasis of calm that is to be enjoyed with spouses after a dedicated, forty year plusworking history of loyal employment. The dream of finishing work and taking life at a more leisurely pace with a nest egg carefullycultivated through diligent savings is becoming a distant dream for many. With the increasing cost of living, couple starting families at an older age and potential boredom many retirees need and want to continue working past the official age of retirement. For some, retirement may have come earlier than planned. With the 2008 financial crisis and unstable economic times, many were forced to accept redundancy and ultimately early retirement for people five to seven years below retirement age. During this time, the job market was flooded with individuals from all generations, applying for a limited number of jobs. Although experienced in their field, many baby boomers CV’s may have reflected loyalty to a small number of companies, not the ruthless and strategic job hopping characterised by younger millennials, which may have made them less appealing job candidates. The crash left a high percentage of this generation, unceremoniously waiting for ‘something to come along’. Others may have elected to retire early. Many younger baby boomers aged in their early fifties, have dreamed of working for themselves, took redundancy as soon as it was offered and are now searching for the business opportunity to make their dreams a reality. However workers from the baby boomers came to be retired, many may have found it difficult to be without their nine to five routines. Their mind still craving the challenge of work, their body requires a solid routine or maybe the sedate lifestyle we all dream of during our working years, is just not enough. What do they do next? Franchising for retired business minded men and women can be a great way to keep them in work, using their skill sets, offering a convenient work/life balance and fulfils their motivation to become their own boss. Franchising allows the older generation to enter into a proven business model and concept, delivers extensive training and support in launching their new business, whilst benefitting from consistent support and advice on equipment, coupled with structured branding and marketing plans. A franchise can also offer speed of set up, which may be an important factor for someone from an older generation who may need to see a return from their business quickly. The franchisor will be experienced in launching a new franchise quickly and efficiently whilst working to a ‘road map’ for opening new franchises. It is possible that older potential franchisees may need to take money out of the business to live and maintain their family livelihood. 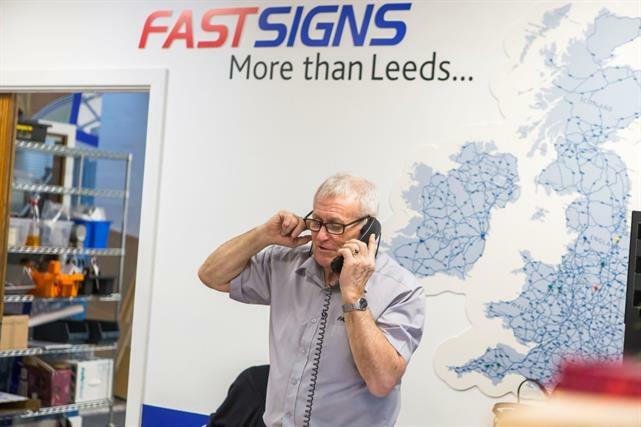 Specific to FASTSIGNS, we factor into your initial business plan a franchisee wage and most franchisees can expect to breakeven on their investment within 18 months since launching the business. Are you currently retired or have you recently been made redundant? A FASTSIGNS franchise could be for you!